Though your stream is personalized to deliver the stories you want, you’ll still hear the top news of the day and the stories you had no idea would captivate you. Even with the breadth of public radio at your fingertips, you won’t lose touch at home. 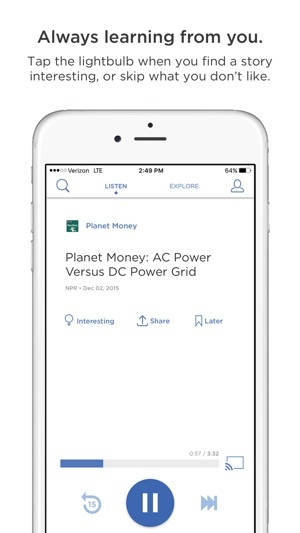 Local news and podcast episodes are woven seamlessly into your listening experience. Local stories, locally reported, are delivered daily. Community is everything. Love to listen on the go? Get the most out of NPR One with Apple Watch. Control your playback at a glance without touching your phone. 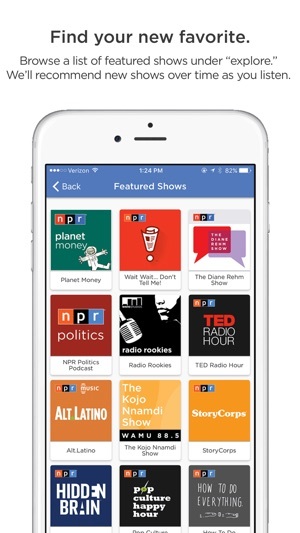 NPR One continues to evolve. Please join our Google+ community, or tweet to @NPRone with any feedback. Thanks for listening and for supporting public radio. Now it’s easy to discover NPR's world-class journalism and storytelling, whatever your tastes may be. 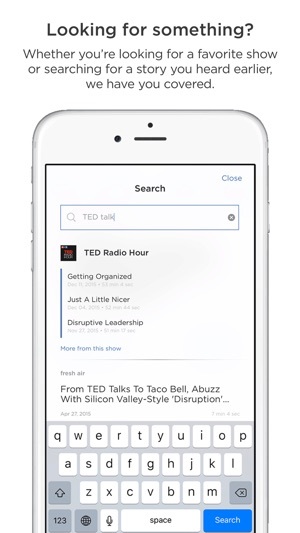 From local and international headlines to your favorite shows, NPR One lets you create custom playlists of the content you care about most. Just start listening to receive handpicked suggestions that explore your interests—or lead to discoveries you might have missed. It's like a personal NPR station to go. 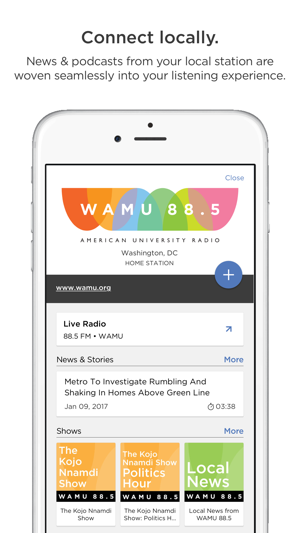 Using the NPR1 app has become a part of my daily routine. I always start my morning with the Up First broadcast. I like how the app automatically moves between a myriad of shows, since I’m usually multi-tasking and rushing around while listening. However, I do wish it was easier to find which shows I recently listened to or which ads for new shows popped up while I was listening. The content is great, but this part isn’t very user-friendly. Sometimes I hear an ad for a new podcast and before I can process and “click on the screen to learn more,” it’s already gone. There have been many times when I’m driving, cooking, or just somehow disconnected from my phone that I miss a show I wanted to hear more about. Maybe a “recently played” or “recently suggested” would make this easier. 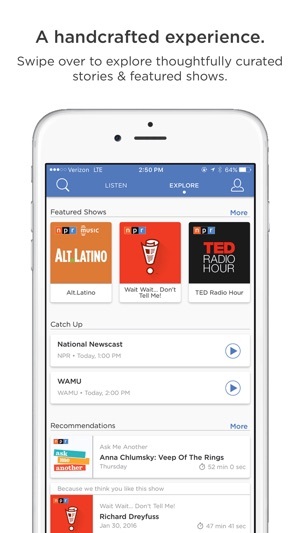 When I’m not starting with the news, I tend to switch to other podcast platforms simply because I don’t know or can’t find what I want to listen to on NPR1 (though I know I would rather hear its content). Other than that, I really appreciate the diversity. I don’t subscribe to one political party, so I’m always searching for a more balanced and empathetic coverage that fairly describes both views (even the view I disagree with). Though NPR can still lean more in one direction, it is the best I’ve found so far and I appreciate how the hosts usually refrain from emotional or opinionated responses. I’ll continue listening and using for a long time. It would be hypocritical of me to rate NPR1 anything less than 5 because even with its frustrating feature shortages, I listen round the clock. I get that the lack of controls/queue/15-sec-skip are to promote binging and “discovery” outside my usual subscriptions. If that’s the goal, then send me more variety in new/local/non-NPR shows. (Even add shows outside my lefty echo chamber :o). I’m over the fact that clicking “interesting” simply gets me more stories from that show or category rather than nuanced insightful predictions like Netflix (yo, non-profit budget). Still, within the simple objectives of the app, there are some essential practical improvements. Many of us listen while driving/doing something else with hands and eyes. We can’t always share, rate or save before the story disappears, and the hmmm moment often comes at the end of an episode. We might not even see the name of the show that just ended so we can look it up. Please add the option to go back or at least see previously heard stories. We also wander away from our desks/attentiveness and want to know what we missed. I’ll put the rest of my suggestions in the app’s suggestion box.